I’ve stepped back from painting these past few days to plunge into the next novel’s rewrite. But the change forces me to wonder, what happens in writing that doesn’t in painting? I know I serve both arts because neither one has all that I need. Am I wrong to fancy that I give you something different in experience when I open a door into the character’s heart with words, than I do in a passage of paint set down in passion? If I could also master music on my harp, would I then need all three modes of making, jostling for the hours of my day? Each creation with a different capacity? I do have a harp… to tell the truth, I have three. One, a floor harp, travels with a young man I know on a long-term loan. He began about the age of eleven to pursue music, and my first harp has gone with him for the last nine years. I have a little travelling harp, a Limerick that I’ve played by the campfire in the Northern Sierra, simple tunes for nights among granite boulders and looming pines. Ponderosa mingling with poplar among the flowers of the early summer, patient with the notes from my hesitant fingers. I remember Mary Jane telling me men shouldn’t play the harp because when they graduated to pedal, they wore no skirts to conceal the inelegant mouse-dart of their feet pressing the pattern of sharps. 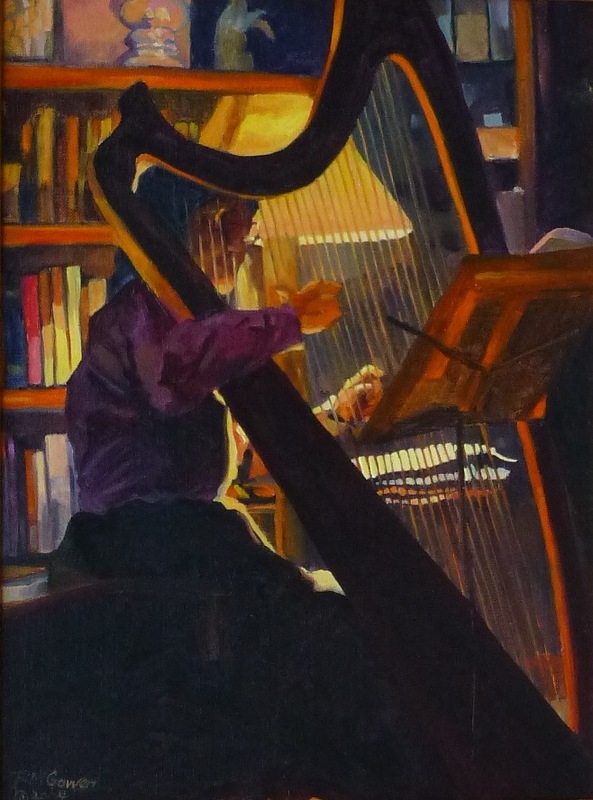 Mary Jane Barton taught me the harp in her pristine apartment in the retirement community. Over ninety two, fingers like mis-strung beads, but arthritis didn’t stop her from her hours of daily practice. She terrified me into learning to read music, a lesson no piano teacher ever managed. When I started piano at the age of five, no one including me, realized for years that I couldn’t read music. I replicated the sounds my teacher played, her timing and touch on the keys, the way she turned the pages. Mimicry. Mary Jane Barton gave me a great gift. After she died at ninety four, (http://www.newspress.com/obits/2-20-2005obits.htm ) I painted a self-portrait, almost faceless in dim evening light, playing my great harp: A Tune for Mary Jane. Crossovers. One creation informs the rest. harpkit.com ) Finished, polished, the sharping levers precisely placed, rivets repaired at need. He believes I could play all parts of our private symphony with merely a little practice, and there come some winter evenings when the notes fall so sure and clear I nearly believe it myself. I ‘ve been silent longer than intended and here’s why. 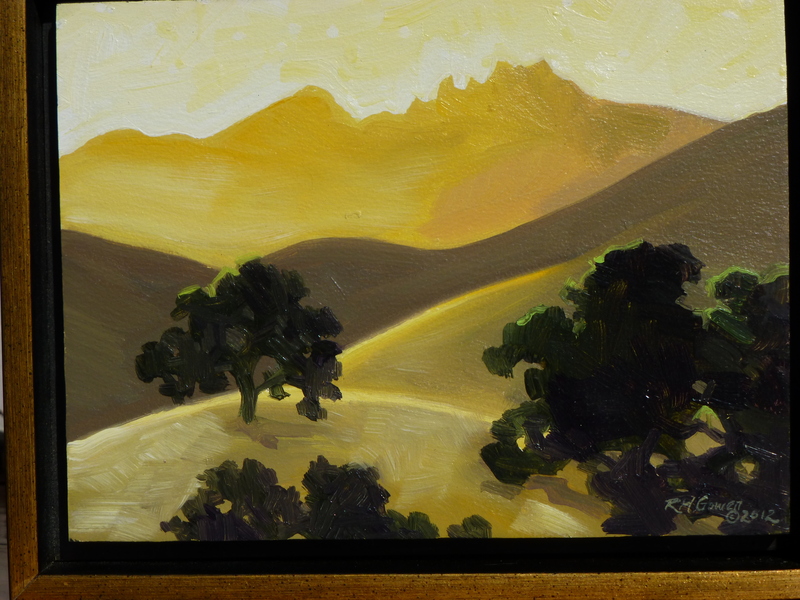 I’ve been off these past few weekends teaching landscape painting. En plein air has been much misunderstood – in my book it is one of many ways to face the process of painting, not the one holy path to truth. But en plein air is a healthy correction to studio perceptions, and forces the painter to face the fact that the job of painting landscape is impossible. You will only, at best, seize an abstraction of the world where you place your feet. How do you humbly distill, how do you take some powerful essential from the amazing extravagance the outdoors offers? How do you pick your time – because the world changes as you stand and breathe, the shadows flicker in and out of existence. There is no single truth ever. Instead, each movement of your eye, each shift of a nanosecond, reveals another. Time is often likened to a wind in restless motion, tugging at us and thrusting us off our feet. The world itself is changing and we don’t approve, not one little bit. It means the loss of a friend, a question about who and what we are that we thought was settled long ago. En plein air puts us in the way of such thoughts and such disturbing currents. For this course we run brutal painting marathons in the Sedgwick Reserve of the University of California. http://sedgwick.nrs.ucsb.edu We get up at six AM (and I am no morning person,) paint and teach until nine before I take breakfast then go back to the painting, come in for the critique around eleven, eat lunch, go back out by around three depending on whether it’s a really brutal temperature, paint until eight or nine, come in to eat dinner and critique and fall into the tent around midnight. The coyotes can usually be counted on for matins before dawn. So we’re estimating that temperatures the first of the weekends at Sedgwick hovered around 105 F. Roasted and toasted and blasted as well. The second was balmy by contrast – merely in the nineties. But I’m happy with the paintings. I’m even happier with the students. I love seeing people testing assumptions and techniques in order to add to their tools and skills, and the only way to do that, is to take risks. I’ve deliberately stretched and taken many a pratfall in public to prove the point that if you do what is safe, stay upon the lines of what you already know, you cannot grow. Indeed, if you play safe within your mastery, you die. We all move back from change, eye it with suspicion, with something that can even become fear if we don’t step into it, don’t seize upon it. But change has another meaning, and you’ve heard it before and you’ll hear it again, because it’s true. Turned on its head change is opportunity. Out there under a blazing sun, or in the chill fog, lies opportunity. A bird must move into the changing surge of wind; there’s a point when hesitation means destruction, where hovering is not an option. To turn back into the power of the wind is to fall. Do I think this way when painting? You may be sure of it. The work that earns immortality doesn’t know about repetition, nor safety. It doesn’t depend upon old solutions and comfort zones. There is no ceiling and no end to it, because the work goes on forever, like the sky itself.